The Murrieta Fire Department brush unit that has been assisting in fighting the Soberanes Fire in Monterey County has been redirected to the Pilot Fire in the San Bernardino National Forest, Murrieta FD officials said today. The Brush Unit 8634 crew has assisted on three consecutive fires this summer: the Sand Fire, Soberanes Fire and now the Pilot Fire. Murrieta Battalion Chief Steve Kean is a strike team leader on that fire. Overall, about 400 firefighters are assigned to that fire, which is burning south of Hesperia. 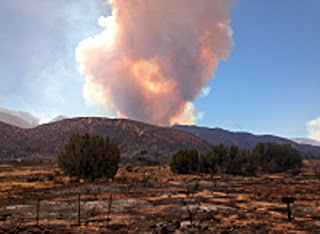 Since the fire was first reported on Sunday, it has covered more than 4,500 acres and is 5 percent contained, according to a news release. The cause of the fire is under investigation.